The view from mum the camera woman! Nellie as coach or actually mascot! Four weeks to go and I planned to start the season with a confidence giving BE100 at Twesledown, but this was cancelled. Far from ideal, Gatcombe was now my first run of the season, not only Nellie’s first Novice but mine as well! I always try and turn setbacks in to positives. 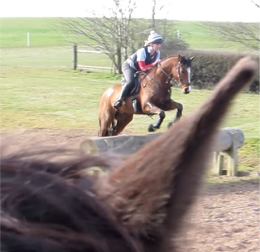 We needed xc training urgently, finding time to train is precious, but at least two horse could now get xc experience. Our reliable little trailer had had a much needed new aluminium floor and new brakes, thanks to Mark at Badminton Boxes. However, when both horses were loaded it was clear we had a puncture. Desperate not to miss our slot at Stockton Lovell and get back for swim training, Mum dashed to borrow a friends trailer, we reloaded and headed south on the M5. Our problems behind us so we thought. We stopped to register at the office but despite a brand new battery the car would not start. I unloaded Nel and set off while Mum got a jump start to limp to the car park. Mum met me with Acco my other horse, we swapped and Mum walked Nellie while continuing to video. I like to play these back for analysis. Nellie with her separation anxiety meant the video sound needed editing as Mum bravely sat on Nellie ready to bail out at first rear and dodging her ears to get footage of Acco. Not a minute was wasted on the journey home as competition entries were planned for the 5 horses I try to juggle with Pentathlon and A levels. Another meal on my lap and I made swim training on time..just! My pentathlon training is demanding, there is no skiving. I have to keep a log which is evaluated each week to keep my place on the World Class Programme. 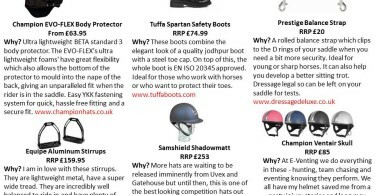 This puts pressure on my preparation for eventing. 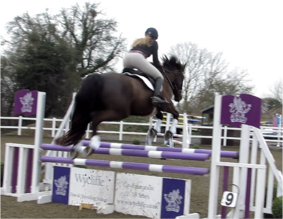 Nellie needed to show jump before Gatcombe. We got a slot at Summerhouse to school Nel and my little project pony that I bought from the sales, thinking I’d produce it in my spare time!!! Horses and car performed impeccably. It turned out the car had a faulty alternator, but finding time to get it seen to was proving tricky. Being local, Dad dropped me at Gatcombe to course walk, he was so embarrassing as he played rugby with my brother Charlie. I left them behind and took the opportunity to run the course…. six times, something to put in my log that was otherwise beginning to be a bit biased to horses, not sure why that could be!! Then Mum turned up, another course walk in the dark brought back memories of our course walk at Aldon where we qualified. Time had once more got the better of us and I am under no illusion that my Badminton preparations are even close to ideal. 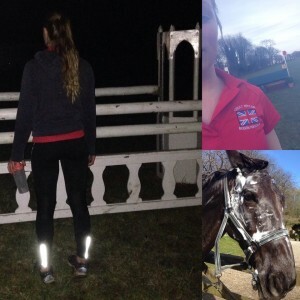 8pm and Nel the bog pony needed a transformation to super smart Eventer rather urgently. Head torches on mane combed, snipped and trimmed; pulling was not an option as Nellie took that as instant excuse to rear. Stud holes prepared, feathers and dare I say trousers trimmed. Then despite an earlier shampoo she was released from the gate to wander off across the field. 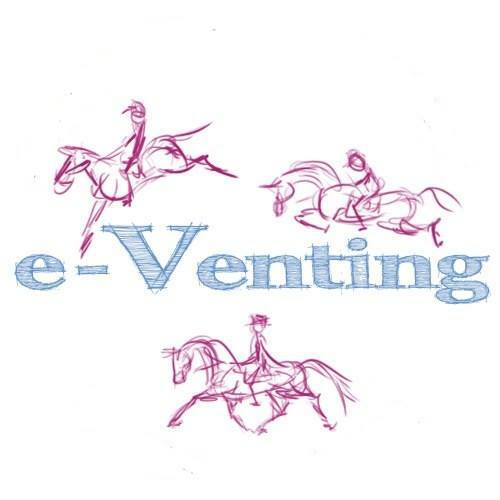 Our horses are never stabled, fresh air and a natural environment keeps them happy, healthy and in Nels case relaxed. Bed by 11pm, up at 5am, but not to swim this time. Breakfast and plaits in, it was time to load. Well Nellie either sensed the new floor or the plaits had raised her panic levels. After 30mins of patience, persuasion and various head collars and finally a chifney, borrowed by waking a neighbour, Nellie had made her point. Hacking to Gatcombe was not a great plan, so down the valley I ran to pull poor Acco out of the mud. 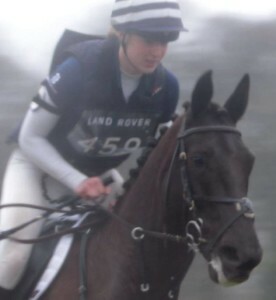 Still in his pj’s he trotted up for a day parked at Gatcombe. Nellie then could not wait to get in. Nutty Nellie! A very fitting name especially on this occasion. 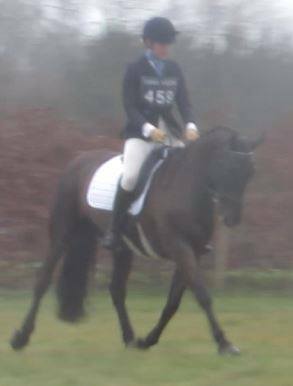 So with only 40 minutes to stud and tack up, we were in to the dressage in the driving rain. 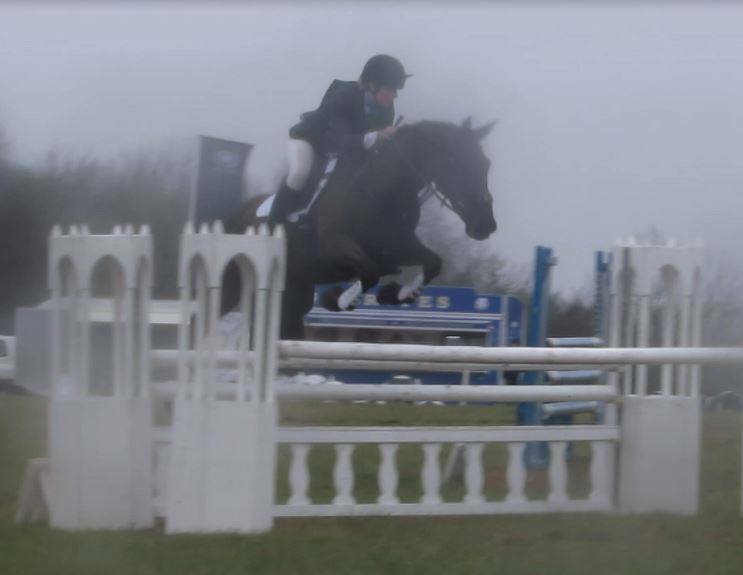 A decent 31.3 dressage was followed promptly with a super clear showjumping in deteriorating conditions. 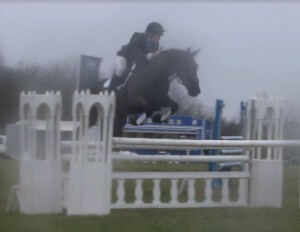 Going in to the xc an exhilarating round gave enough time faults to ensure we dropped from 2nd to 11th. Obviously not planned…but I could not afford too many points as this would disqualify me from competing at Badminton. It was a tough first course, but Nellie had been on fire. Amazing to think it was only our first Novice and we could have been 2nd, so pleasing, and glad our preparations were coming together. 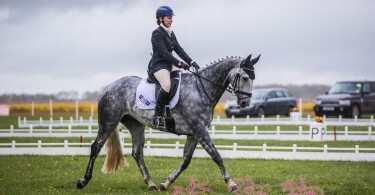 Next stop in Nellie’s diary is Larkhill tomorrow so keep following to hear if Nellie decides Gatcombe was fun enough to load and fingers crossed she keeps her dancing shoes on for another super performance. Winning our first proper point was a proud moment and hopefully the first of many to come! It means Nellie is allowed 6 more before Badminton ballot date so maybe this time I might allow her to run a little faster! With Badminton entered it now feels within touching distance. Our Larkhill times mean Nellie will have to load in the dark for a 4am departure, let’s hope we don’t wake the neighbours!! Badminton Blogger – And we’re off! Badminton Blogger – Koi Carp anyone?